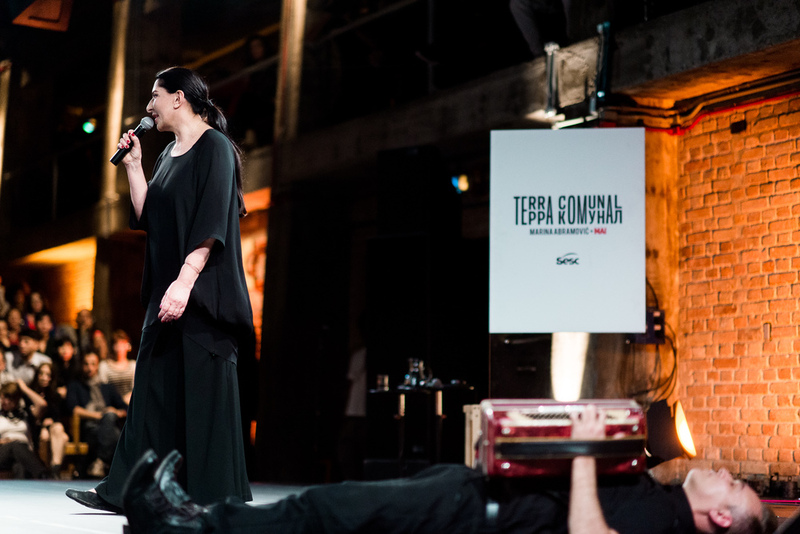 Body Drama was the main subject of Marina Abramovic’s fifth lecture at Terra Comunal - MAI. 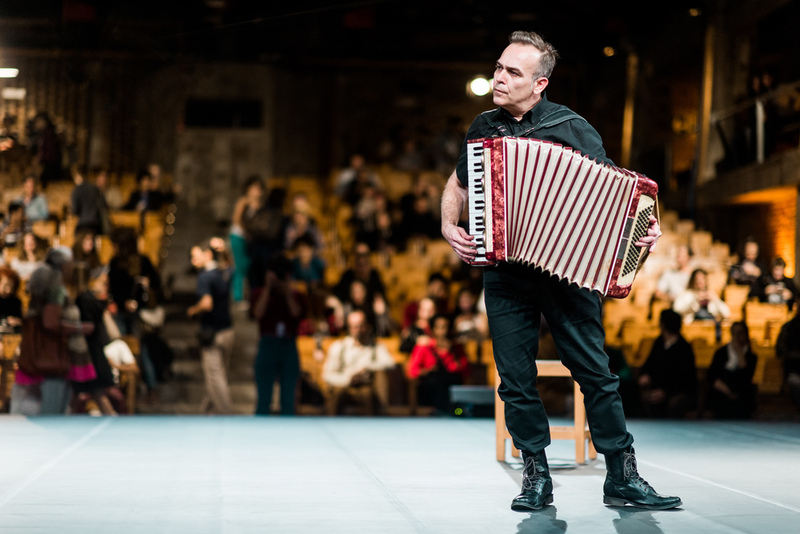 Ten minutes before the lecture, the doors of the auditorium opened and the audience was received by Marco Paulo Rolla, an artist from the MAI Presents section of the exhibit, performing with his accordion. 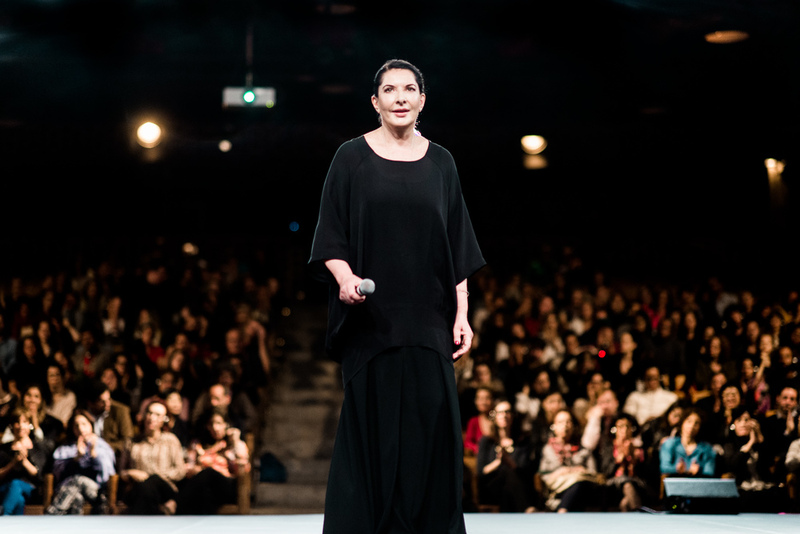 Rolla remained on the stage for the duration of the conference. "It's very difficult look to [at] something when nothing happens, to quiet your mind for it. 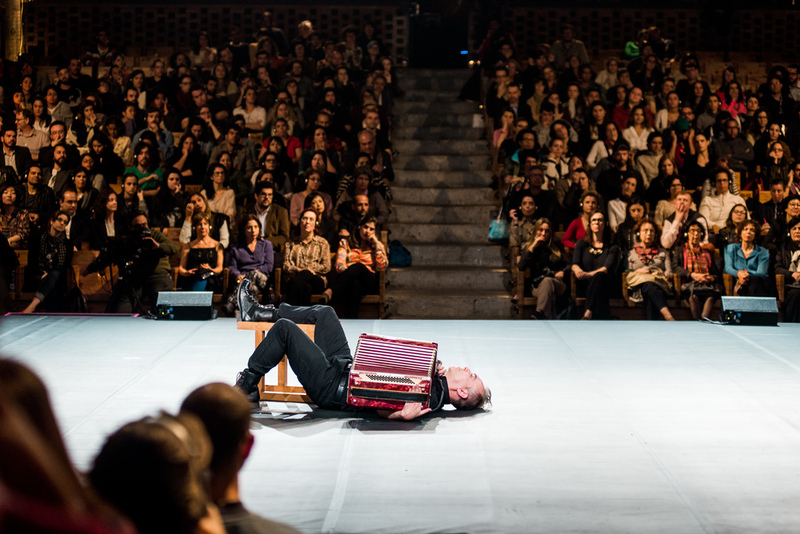 Long durational performances are about that. They are about time and just being there. It's about ability to look for something knowing that nothing will happen." Abramovic started off the lecture by talking about body parts and the importance of artists creating works with a specific body part in mind. Just as her previous lectures in this series investigated performances concentrating on the head and hands, among others, this conference addressed the feet, chest, and eyes. Video clips exemplified this focus on performance as localized in the body: Pina Bausch’s feet dancing in her signature style; performer Susanne Ohmann running through a forest bare-chested in The Chase; an eye being slit open by a razor blade in Luis Buñuel and Salvador Dalí’s Un Chien Andalou (1929). "There's a big difference between theater and dance. There's a big difference between dance and performance. But that difference isn't so important when we think of Pina Bausch. She doesn't play emotions, she experiences them." "That's a term I invented myself: Body Drama. To understand it, let's think of rock stars, their relation with big audiences, hundreds of thousands of people and the energy that comes from the public." "I'm showing Maria Callas not because of her singing. She was this incredible charismatic diva. She'd say: 'when I perform, I let half of my brain loose. And another half is in total control.' That makes a performance good. A mix of strength and fragility." 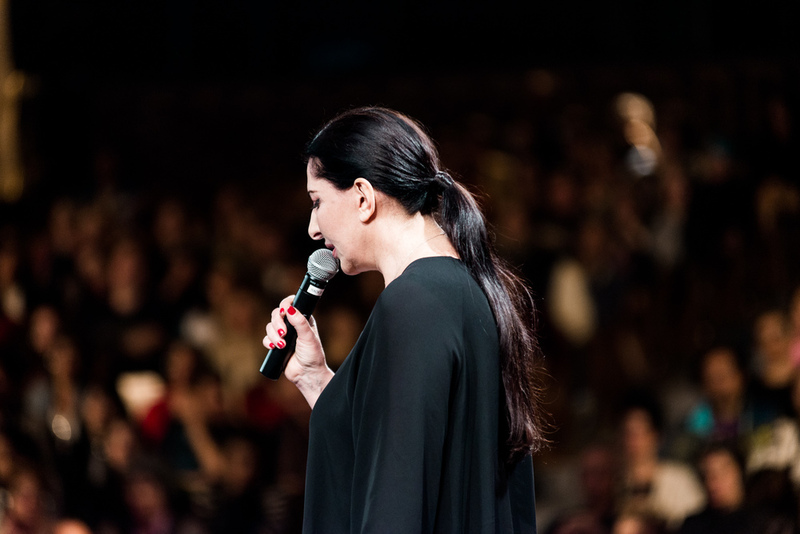 Abramovic explained that she had personally selected all of the videos screened at the conference, and she chose as her final clip of the evening a scene from the Hollywood classic Sunset Boulevard (1950), directed by Billy Wilder. The film itself is a melodramatic representation of an artist relying on the public to reinforce their creative ability. "The public feeds the artist." The lecture ended in applause at 10pm BRT. 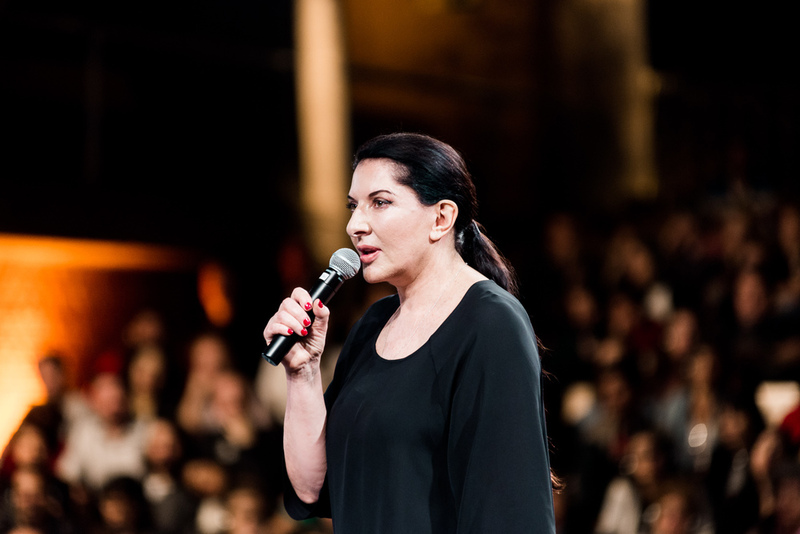 Check our calendar for dates and times of Marina Abramovic’s remaining four lectures in this series.